Below is the picture and text for our title card, The Burning Serpent. 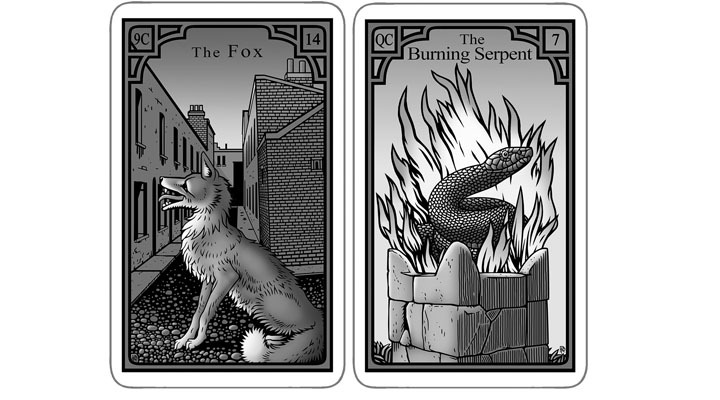 As with the other cards in the deck, and our approach as a whole, the basic meanings are rooted in the Lenormand tradition, in which Snake (as card 7 is usually called) is primarily a card of danger, and specifically an enemy. There is an interesting secondary meaning, that of a smart or manipulative woman. The text then goes on to explore dimensions and possibility of the image, including the power of snakes worldwide. The reason I am showing it here is because of something interesting that has just happened to open up yet another level of the picture for me. 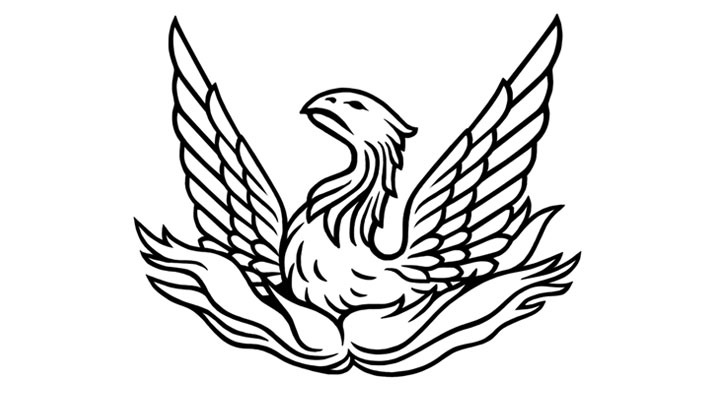 A friend of mine, who is a scholar of Judaism and Ancient Israel, wrote me that the seraphim, who guarded the inner sanctum of Solomon’s Temple, were depicted as–flaming serpents! Some people assume that when an artist creates an image, and a writer writes about it, that this is the last word on the subject. But in fact an image is a living thing. It changes as we learn and experience the world. A couple of years ago, I wrote of the Tarot, “The one thing I can say for certain is that you will never come to the end of it.” We can say the same for any oracle deck, for images–especially images grounded in a tradition, as we have tried to do here–reach beyond our conscious plans for them. Enemy, betrayal, danger. A smart, possibly manipulative woman. Spiritual transformation, rebirth or restoration. Ancient wisdom, intuition. This is the title card for this deck, and one of the first images. It has many complexities, fitting for an animal that seems to compel people’s imaginations and stir deep reactions all over the world. Beyond the facts of snakes—poison, shedding skin, healing properties, visions—just the very sight of them seems to touch something very deep in the human psyche. Maybe as evidence of this power, the traditional meanings for card 7 can vary widely. Some say it represents a woman, though even here the meanings range from duplicitous to trustworthy. The woman might be cold, unemotional, for snakes, after all, are cold-blooded. Others see snakes as danger, or betrayal, but not necessarily from a woman. Some see the snake as a warning to be on your guard, to watch carefully. Snakes usually strike suddenly, often before we’ve even seen them. The negative meanings would get emphasized with the Fox, or the Mice. There is a modern meaning, minor but fascinating in the way it demonstrates one of the ways that the Lenormand tradition adapts to new things. Because snakes rarely appear stretched out—even when they move they look more like a wave than a stick—and most often are seen curled or sinuous, they can indicate anything in curved form: a journey over a winding road, a twisting path, the intestines or intestinal diseases, pipes, or wires and any objects or systems that use them. As stated above, for many the main meaning is a woman, most often someone not to be trusted. She may represent the third person in a love triangle. The twisting movements of a snake suggest cunning. And yet, some see the woman as older and wiser, maybe because snakes are thought of as carriers of ancient wisdom (see below). The surrounding cards can help guide us through this winding—snake-like—path of contradictory meanings. You also might wish to make your own choices of just what this card means for your own divinatory practice. 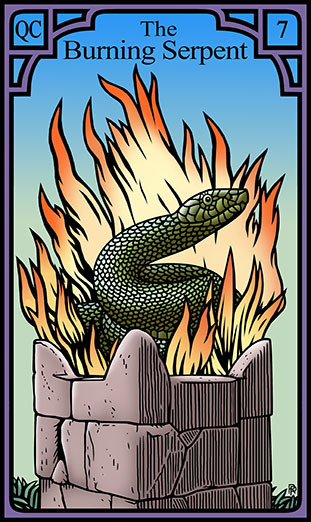 In the Grand Tableau, if the Burning Serpent appears near the client, especially underneath or to the right, it warns of betrayal, jealousy, or sabotage. Beware the snake in the office. Again, the Fox increases the danger, though if Fox appears before the Serpent its cunning may uncover the threat before it strikes. The association of a duplicitous woman may derive from Eve, whom many see as allied with the cunning serpent in the garden to deceive Adam and bring about humanity’s downfall (the Bible story does not actually say that). Other traditions, however, see the snake as the Goddess’s familiar, even her consort. A famous figure from pre-Greek Crete depicts a fierce goddess holding a writhing snake in each hand. In modern times Marie Laveau, the famous “Voodoo Queen” and card reader, was sometimes painted with snakes wrapped around her. The Ancient Sumerians depicted the primordial being, out of whose body the world is made, as a female serpent named Tiamat. For the Norse peoples, a great snake wound around the world, holding it together until the final destruction. Voudon (Voodoo) cartomancers are not the only people to hold snakes. Some Pentecostal Christians handle poisonous snakes to demonstrate God’s protection. There may be more to this practice than an expression of faith. The venom of certain snakes can induce religious visions and states of ecstasy. The crown of the Pharoahs displayed a snake head at the forehead, the place of the third eye. This intense history of snakes in mythologies all over the world suggests we can add ancient wisdom or intuitive truth to the usual meanings. Snakes shed their skins to grow. The image of a renewed creature emerging from an old worn-out casing suggests renewal, trans- formation, even immortality. More practically it can mean leaving something behind that no longer suits you. Some snake venom has healing properties, as well as the power to induce visions. The Greek god Asclepius, god of healing, received a staff with a snake around it from his father Apollo, god of the Sun. Asclepius used his staff to heal people, primarily through dream visions. And of course, two snakes wound around a stick form the caduceus of Hermes. 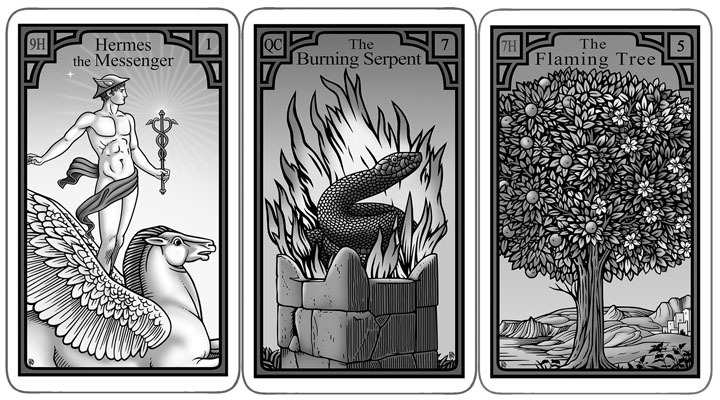 Thus, the Burning Serpent becomes linked to card 1, Hermes the Messenger, as well as the other fiery card, the Flaming Tree. With so much possibility, so much meaning, what of the Burning Serpent image itself? The actual snake in the picture is a Hudson Valley garden snake. Robert described to me how his wife, a professional gardener, made friends with such a snake. I also have a snake living in the stone steps outside my back door. I consider it a blessing for the home. Robert has drawn the Serpent in a stone structure based on an altar from Ancient Israel. In the days of the Temple the priests performed “burnt offerings,” animals sacrificed for their life energy to travel up to the heavens. Though in practice these sacred barbecues fed the large caste of priests and their helpers, supposedly God was seen to have accepted the sacrifice when the body was “consumed utterly,” that is, nothing left but ash. Thus, one of the meanings of the card might be a sacrifice that liberates a person (say, giving up a hated job), or offering something in a spiritual vow, especially to avert a danger. When I was fifteen I was diagnosed with bone cancer. Unbeknownst to me, my parents swore to be kosher if God would spare me. When the surgeon opened me up he discovered a large calcium deposit rather than the metastasized cancer everyone had expected. My parents kept their vow for the rest of their lives. Because the serpent is an animal of regeneration and renewal, the Burning can be compared to the act of shedding a skin that has become too tight, making it impossible to grow or change. Thus, this Serpent in the deck that bears his name becomes like the Arabian Phoenix, the mythical bird that dies in flames—consumed utterly—only to come back to life from its own ashes. In the introduction we looked at Lenormand’s beginning as The Game of Hope, and therefore part of the long tradition of “race games.” One of the very oldest of such games comes from Ancient Egypt, and was called Mehen. 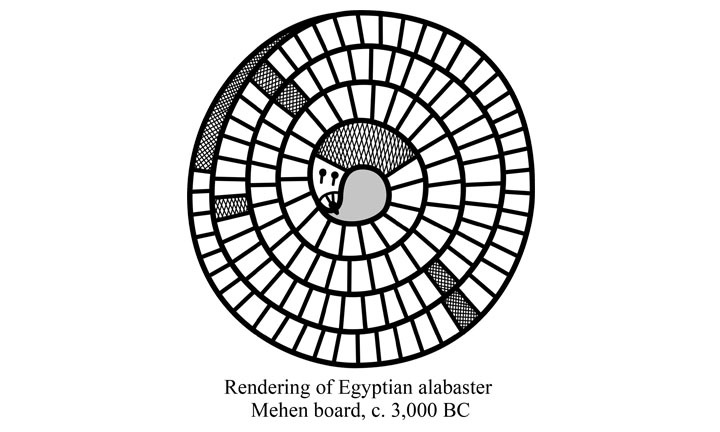 The name, and the shape of the board—a segmented snake—came from a mythological snake said to wrap around the Sun god, Ra. And wouldn’t the heat of the Sun make Mehen a Burning Serpent? Serpent Oracle. I do have 2 questions for you if it’s okay. writing at additional places, I would like to keep up with you. Both Rachel and I are on Facebook.